2v2's are great for teaching all aspects of small group and individual attacking and defending skills. Create a grid approximately 20X25. The first two player from each line will play 2v2 against each other. 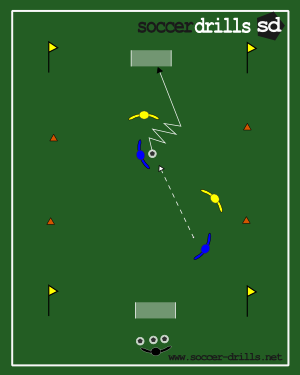 If the ball is played out of the grid or a goal is scored the ball is dead and it is the next two players from each lines turn to play.